The following is an overview of most of the Free State museums in South Africa by location, including descriptions, contact details and website addresses, where available. Embraced by several other provinces, the Free State province lies in the heart of the country. From the major cities to the rural village townships, the hospitality of the people is as overwhelming as the sceneryis beautiful. The Bethlehem Museum is a socio-historical museum housed in the first Mission Church (1906). Bethulie was a London Missionary Society station and the original mission buildings still stand. The Pellissier House Museum depicts the history of events in the area. The house (1843) and outbuildings display 19th Century household effects, farm implements, and war relics. The National Museum was established in 1877 with displays, collections and research undertaken in the fields of entomology, arachnology, mammalogy, herpetology, ornithology, archaeology, botany, palaeo-ecology, palaeontology, anthropology, archaeology, cultural history, rock art and fine arts. The First Raadsaal Museum is housed in a typical South African pioneer's building (1849), the first school building north of the Orange River. The building also served as a church until 1852; was used by the Legislative Council of the Orange River Sovereignty, and later as an assembly hall, and in 1877 became the first National Museum building. Freshford House Museum, with its asymmetrical facade, unplastered red brick walls, bay-windows, veranda and sink roof (1897), is one of the few houses of the upper middle class of the Edwardian period that still exists in Bloemfontein. The Wagon Museum houses a collection of historical wagons and carriages and has displays on the development of transport and the making of a wagon wheel. Bram Fischer House was once the home of one of South Africa's leading lawyers and a legendary political activist. The Military Museum(Queens Fort). The fort, completed in 1849, is on a koppie overlooking the city. It was used as a military headquarters, a hospital, a mental institution, and a jail. It features displays on the Difaquane, Anglo-Boer War, the two World Wars and the Struggle for democracy. The National Afrikaans Literary Museum and Research Centre is a repository of works by prominent Afrikaans writers and overviews of the development of Afrikaans literature. Archival material is housed in the Research Centre. The Afrikaans Music Museum traces the development of music in South Africa, and includes displays on well-known composers, and showcases old musical instruments and sheet music. In the same building the National Theatre Museum features displays on the development of South African theatre and exhibits costumes, photographs and furniture. Originally the official residence of the last three Presidents of the Republic of the Orange Free State, the Old Presidency, dating back to 1885, reflects their lifestyle (late Victorian) during the period 1886-1899. It houses a museum depicting their respective terms of office, and a cultural centre for art exhibitions, theatrical productions and musical events. The War Museum not only gives visitors insights into the Anglo-Boer/South African War through its unique art collection, dioramas and exhibits, it also brings them closer to understanding the background against which the War took place. Visitors are afforded a glimpse into the life in the concentration camps and prisoner-of-war camps. The research library contains an extensive collection of Africana. The Riemland Museum, housed in the old synagogue, is a local theme museum of the Riemland District and also features displays on Jewish history. Combining culture and food, the Catharina Brand Heritage Collection of local history is housed in a restaurant. The Transgariep Museum features, in thematic displays, the Griquas, the London Missionary Society, Emily Hobhouse, and Old Philippolis - the oldest town in the Free State. The Welkom Museum houses displays of tourist attractions of the region, bird life, gold mining, and the careers of Welkom's leaders. 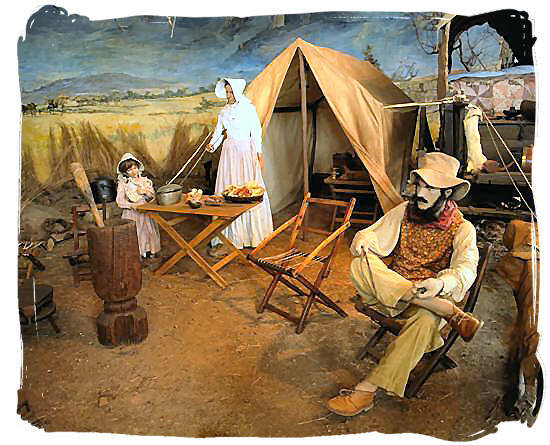 Visitors to the Free State Voortrekker Museum can view displays on the history of the Voortrekkers in the Free State and their interaction with the local inhabitants. The Basotho Cultural Village depicts the lifestyle and architecture of the Southern Sotho. Visitors can participate in food tasting, music, and domestic activities. The S. A. Armour Museum contains artefacts, objects, books, other publications and documents which relate to the history of South African armoured forces. There are also displays of armoured fighting vehicles, parts and accessories. The Florisbad Research Station, a satellite of the National Museum, is situated in an internationally important fossil locality which has produced a human skull dated to around 259 000 years ago as well as valuable archaeological and palaeontological material.